The wonder of Creation is our theme for the next few weeks. On Tuesday, we experienced dark/light. We shut our eyes tight to experience total darkness. We opened them and had light. We spent our class time tuesday with the lights off and on. When the lights went off it was delightful to hear "It's DARK!!!" and likewise when the lights came back on, "It's LIGHT". 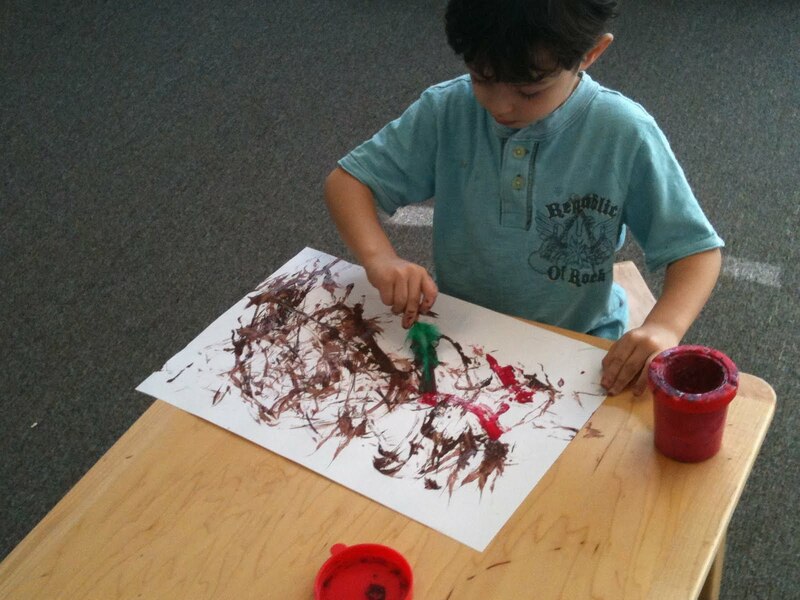 The children are creating a multi-media mural to represent creation. So far we have a sponge painted sky and land, cotton ball clouds and tissue paper grass. Each child also made their own styrofoam earth sitting in a dark sky. This coming tuesday, we will begin talking about the third day of creation, the trees and plants and flowers. This will also begin our discussion of living and non-living things. "Hashem created a world so fine, he did it all in 6 days time." It is sung to the tune of This Old Man. Ask your child to sing it for you. We will be adding a verse as we add a day, and will be singing it at circle and during class time. Thursday was our first Peace Makers circle. 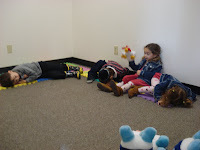 We learned a song about friendship and played with puppets. One puppet, Joe, was not very nice and grabbed a toy from Sally, the other puppet. Sally was so sad. I asked the children what could Sally do? 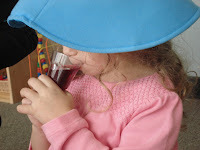 Morah Katie: Very good ideas, let's see what Sally chooses to do. Well, sadly Sally chose to hit Joe. The children raised their eyebrows at this. 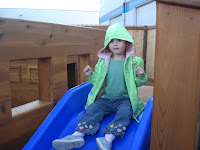 Morah Katie: What do you think of Sally's choice? Morah Katie: How do you think Sally felt if she hit Joe? Sally: Joe it makes me mad when you take my toy. Will you give it back to me please? Morah Katie: What do you think Joe should do? The children decided that Sally spoke kindly enough that Joe should give the toy back. The puppets are in the classroom, they are available for the children to play pretend with, or to use as a way to solve their conflicts. 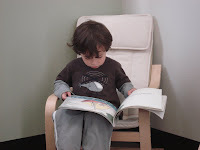 Through out the rest of the day, if I saw an angry face appear, or heard an angry voice, I acknowledged the feeling I saw on his/her face, and I asked the child to think about what a peace maker would do. It was heartwarming to hear, "I am angry you took my swing, I would like it back." This is a process which will involve offering suggestions, mediation by a teacher to help a dialog begin, and repetition. 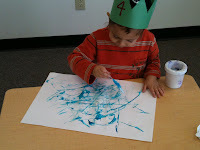 the current letter - R.
We are practicing our writing with connect the dot sheet, and learning our colors and color words with matching. We are counting daily and building on what we know. 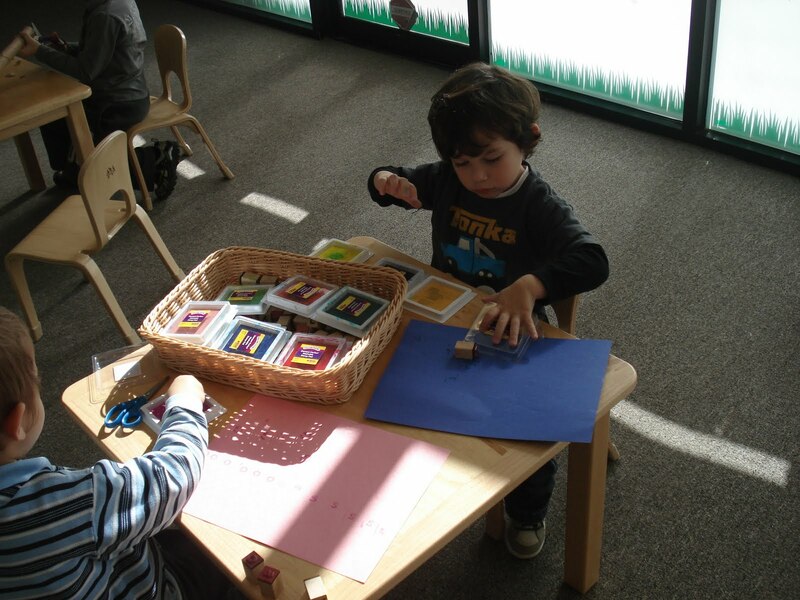 The children are working on recognizing the numerals and counting quantities to match the numerals. 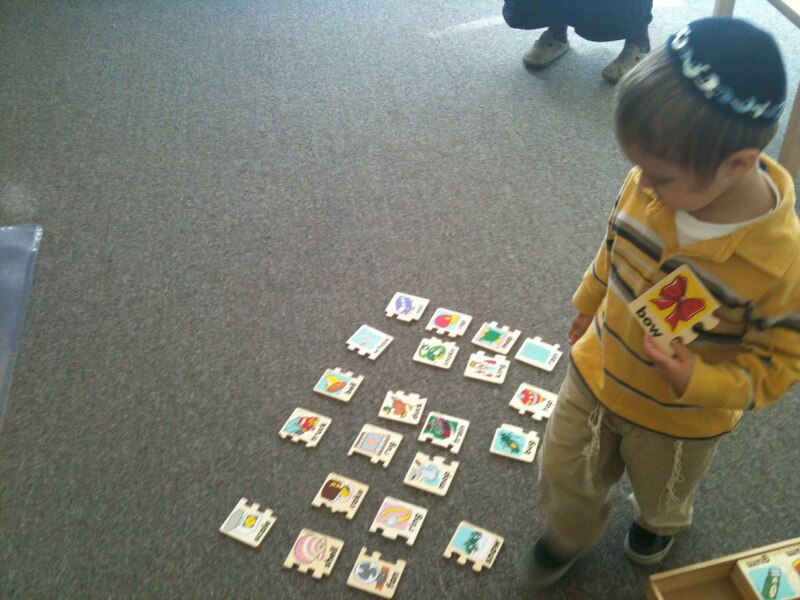 We do this first a few numbers at a time, adding more as the child is able to recall. 3. quantities mixed up, numerals mixed up. 4. numerals and quantities mixed up. Daniel is working with bead bars, 1-10. Quantities are first because they can be held in the child's hand, it is real and concrete. The numerals are symbols and require memory. 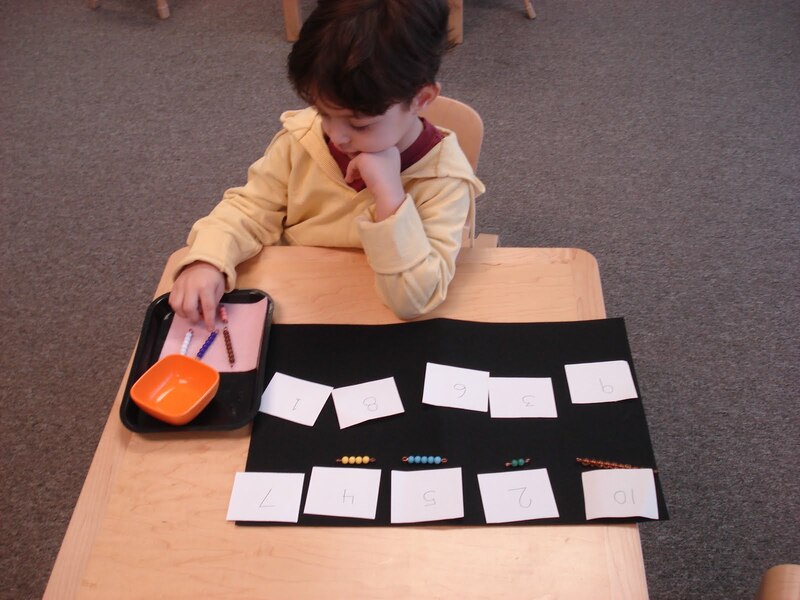 To add to this, we can spread the numeral and quantities across the classroom, which is always a fun memory game. I will be writing observations I make of the children in their writing notebooks and updating them every few weeks. 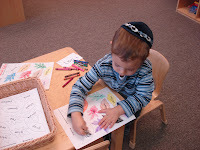 I invite your to please take a look at your child's notebook the next time you are in the classroom. It was an exciting week at The Gan. It was delightful to create the apple tree. 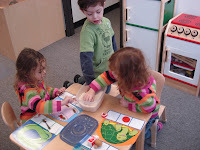 We have received some Montessori materials for the classroom. 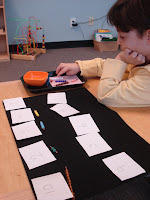 I feel that one of the benefits the Montessori method offers is the multi-sensory approach to learning. 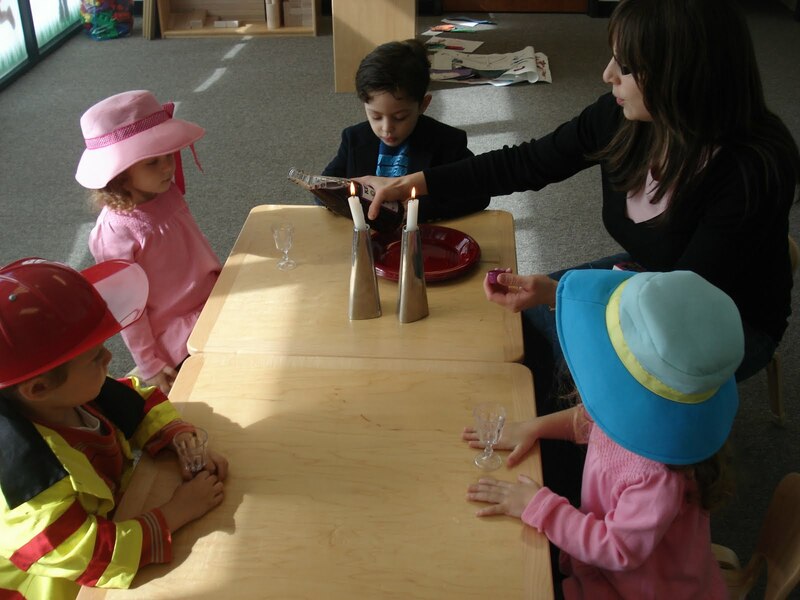 Maria Montessori often said the hand is the instrument of the mind. 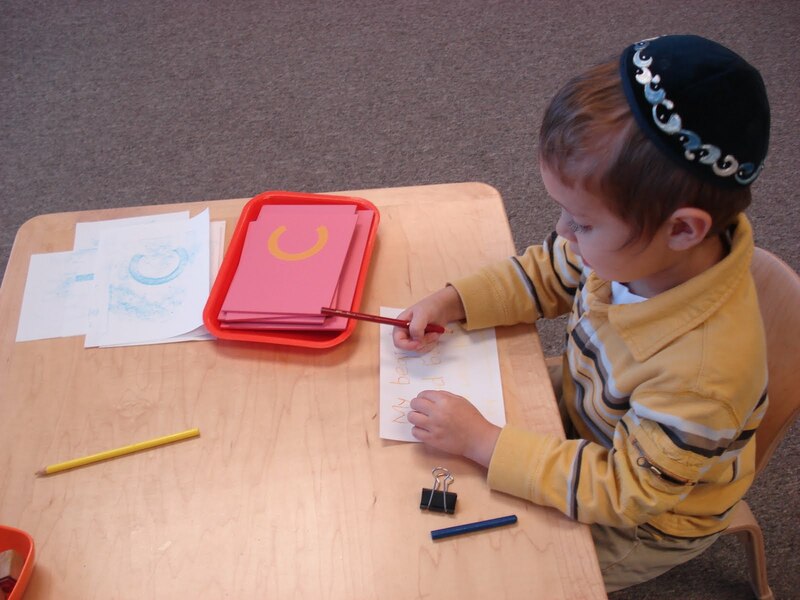 As the child traces the sandpaper letter or numeral, they are sensorially experiencing the texture as they look with their eyes, and say the sound or number. 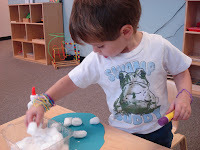 We used rice to hide objects, which began a discussion about the roughness of the sandpaper letter versus the smoothness of the rice in our hands. 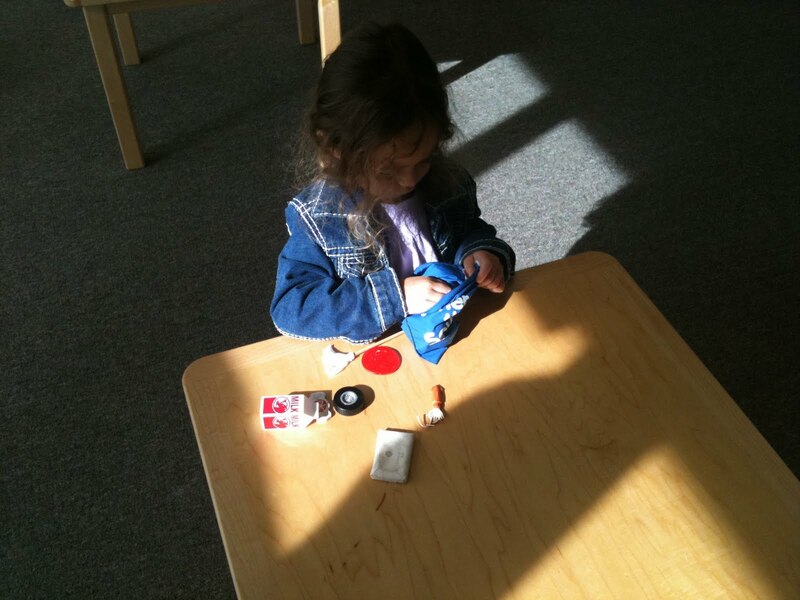 We then sorted the objects by their beginning sounds. We made rubbings of sandpaper numerals and sandpaper letters. It was as exciting for me to watch the wonder on the children's faces as it was for them to make the letter or number appear on the paper like magic, "Hey it's a C!" or "Wow 2!" At Snack time, the children noticed the circle shaped pretzels looked like the numeral zero. Levi: I have a lot of zeros. Daniel: (holding a pretzel) ZERO! Levi: (picked up his pretzels from his napkin) There are zero pretzels on my napkin! Dena: No more pretzels, all done. "When you take my bike I feel mad. I would like my bike back." When ____________ happens, I feel ___________. I would like _________. We will accomplish this by looking at facial expressions in books and asking the question - what do you think they are feeling?Why do you think they are feeling that way? How do you think you might feel if (_____) happened to you? 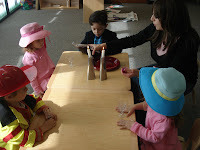 Stories are a fun and safe way to discuss feelings, and offers the children a chance to practice using feeling words. We will talk about the difference we feel when we are laughing and happy versus mad. 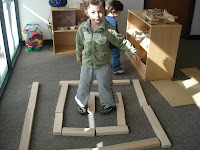 We will practice making and recognizing facial expressions with games and songs. Beginning this week we will begin the theme of the Creation of the World. Over the next few weeks we will be talking about how Hashem created our world. 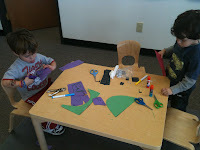 We will create a paper mural as we discuss the 7 wonderful days of creation. We will also begin our science studies as we look at ideas such as living and non-living and the differences between plants and animals. The classroom is becoming a very active place. The children are familiar with our routine. 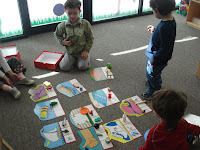 They know that we begin our day with free choice activities. 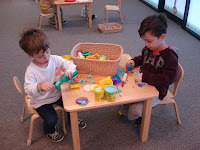 We have group time, snack and playtime. 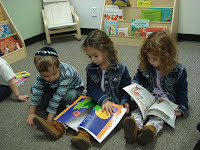 They can count on story time as we transition from play to group and individual lessons. When we sing our clean up song, they know lunch is next and then we say our good byes for the day. 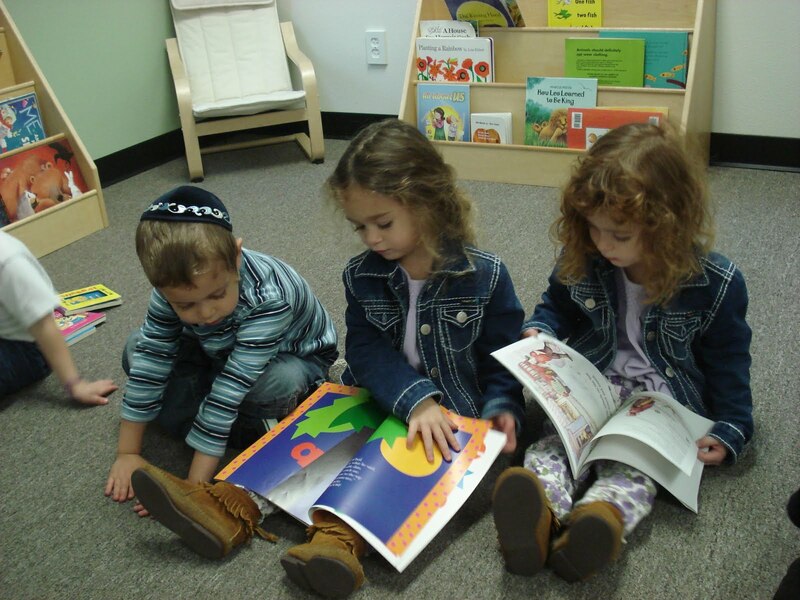 Children benefit from a predictable classroom and routine. They feel secure, which fosters independence. Freedom of choice also builds independence. I encourage the children to look at the activities, what catches their eye? What looks fun? What do they want to try doing today? If one of my friends is very interested in cutting, it is my job to be sure I have papers from him/her to cut. 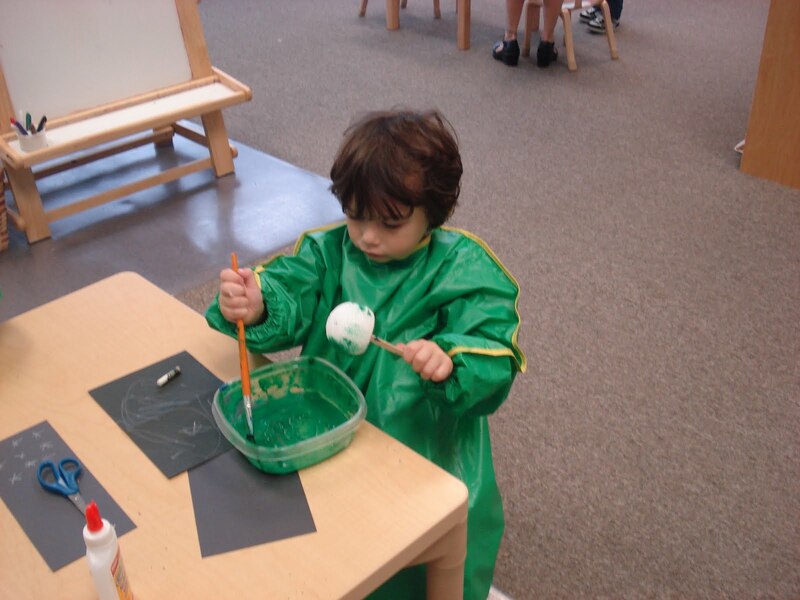 Once this skill is "mastered" the child feels they have accomplished a goal and are ready to move to other areas with increased self confidence. Likewise, if a child is not particularly interested in doing an activity with me, I will not push the issue at that time. 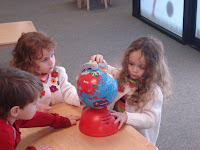 I will do the activity or play the game with their friend, or discuss it at group time. The child will be exposed to the concept indirectly. 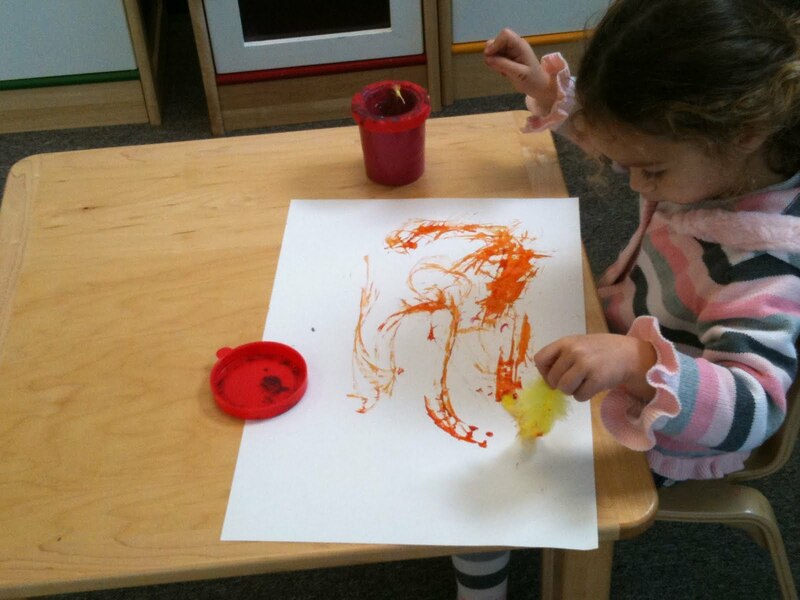 When the child becomes interested, we will get that activity and play. 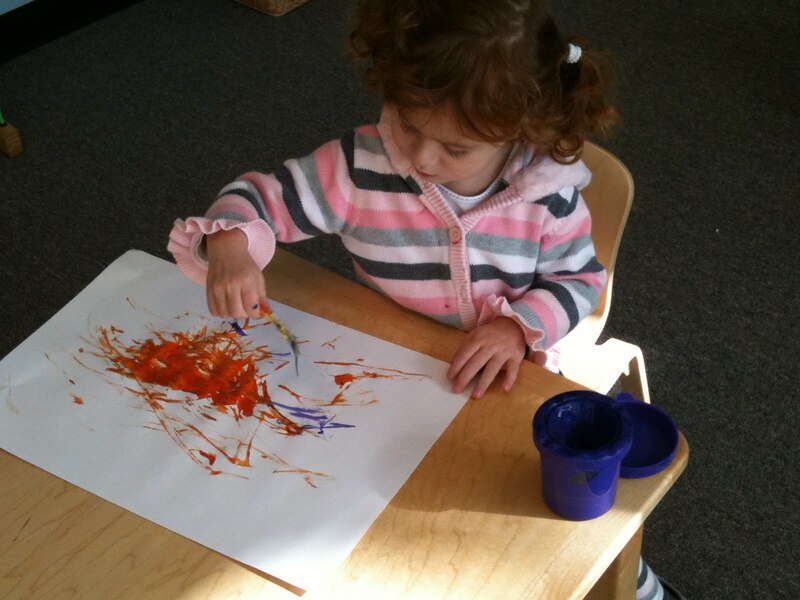 When the interest is there, learning happens easily and quickly. Every child has something to offer in the classroom. 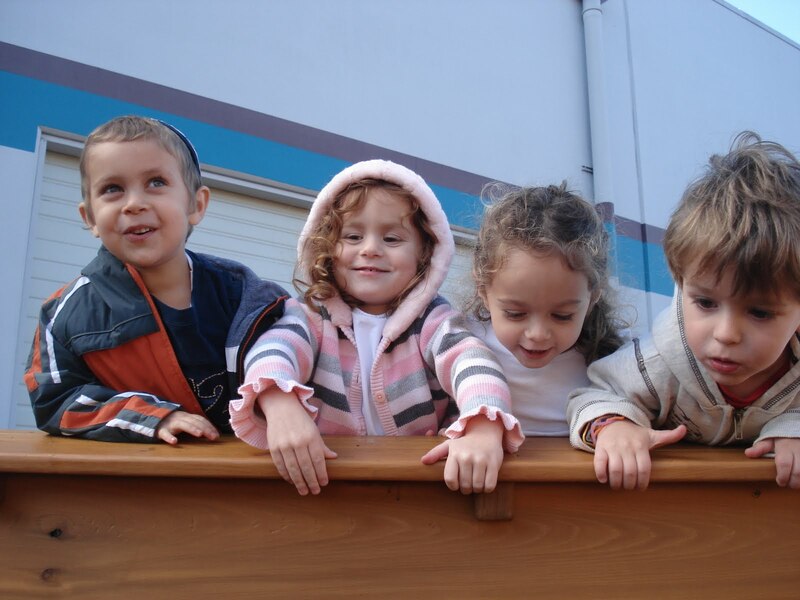 The classroom is designed to be an environment where the children can fully realize their potential - as individuals and as members of the community. Children learn in a variety of ways, some need to do, some need to hear, some need to see. 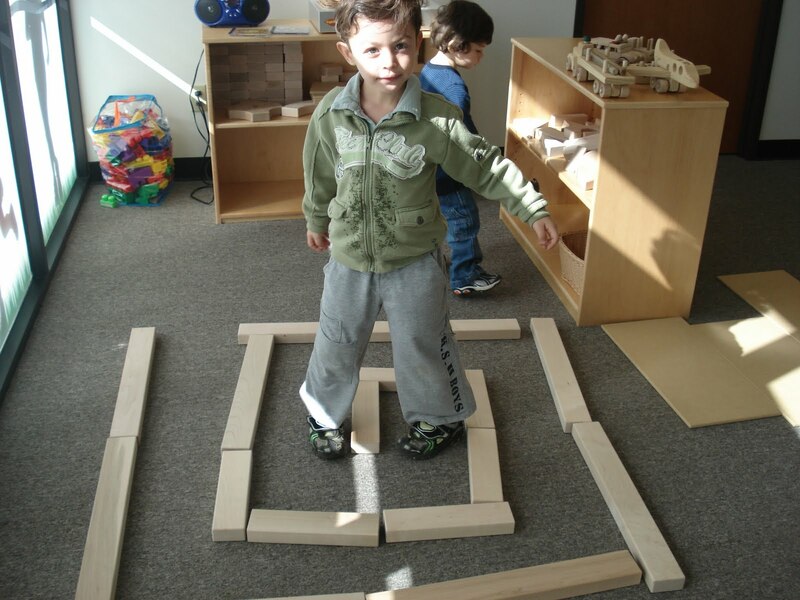 A child maybe building with blocks, and at the same time be listening to his/her friend play a rhyming game. When the block building child moves on to the rhyming game, it is always fun to see just how much was absorbed simply by listening. I do my best to observe the learning styles of the children and meet those needs. 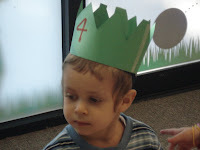 This week we celebrated our friend Levi's birthday. 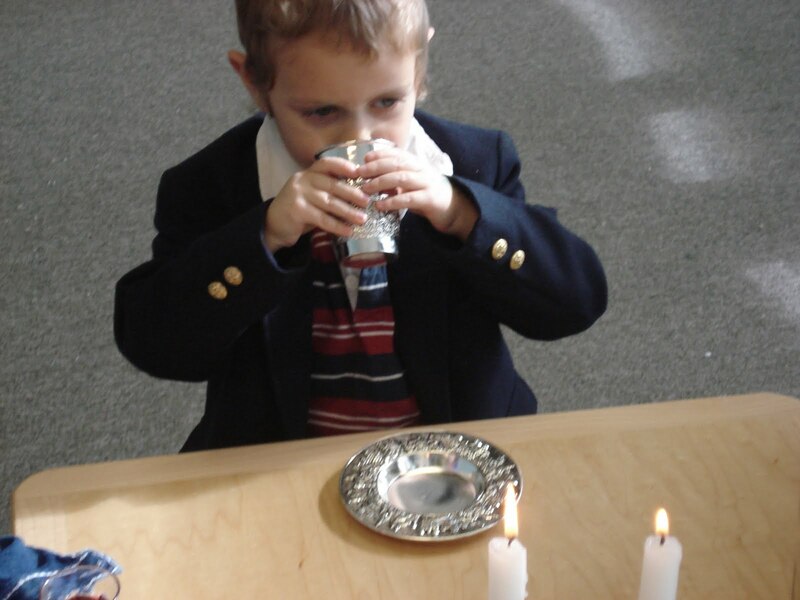 We talked about how this is the day Hashem decided the world needed Levi. We made him a book describing why he is such a special friend, and talked about all the things he can do now that he is 4. The children have recieved writing notebooks. In addtion to the writing work they will be bringing home, the notebook will stay at school. It is always a big treat at the end of the year to see the progress in letter and number writing. We will be constructing our Torah inspired feather painting next week, if you happen to go through another roll of paper towels, I will gladly take the inner tube. We have been enjoying the great fall weather! 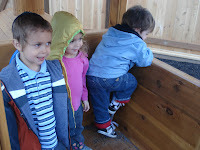 The train is a highlight of our day, the slide, the engine, and of course the kaboose! This week at the Gan we had fun with the letter M. We made monkeys, mittens, even a maze with our blocks. We planned to have a mango at snack. Sadly, our mango was not ripe despite it's very delicious aroma. We decided to try another mango next week, as long as it is ripe. 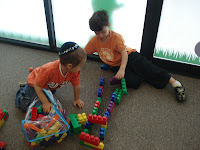 At group time on monday we discovered that Mitzvah begins with M. We talked about what a mitzvah was and I challenged the children to see how many mitzvah's we could do this week. We wrote them on a slip of paper and posted them on our board. It was very exciting to see all the kind deeds being done. 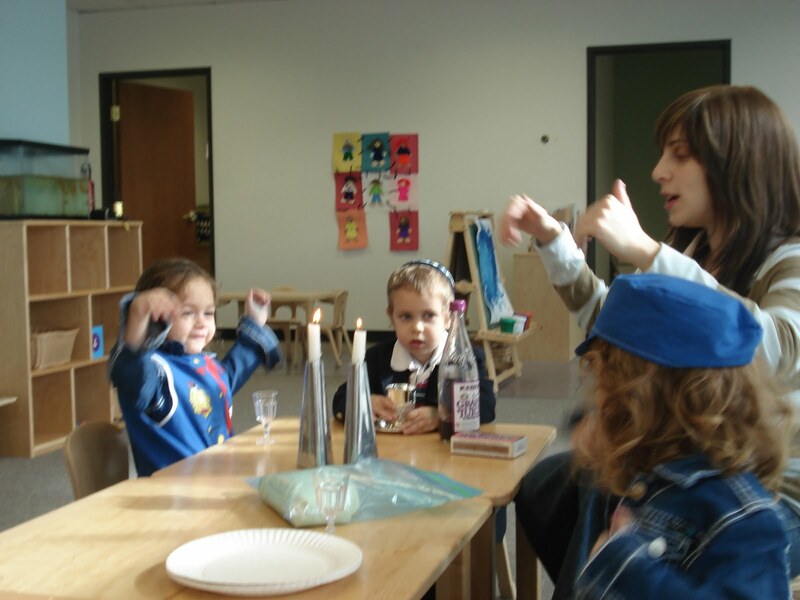 Giving tzedakah at group time is a fun way for the the children to experience doing a mitzvah, please send your child with a few coins for this important part of our group time gathering. Dena: I saw a girl crying. Morah Katie: Was she sad? Was she hurt? 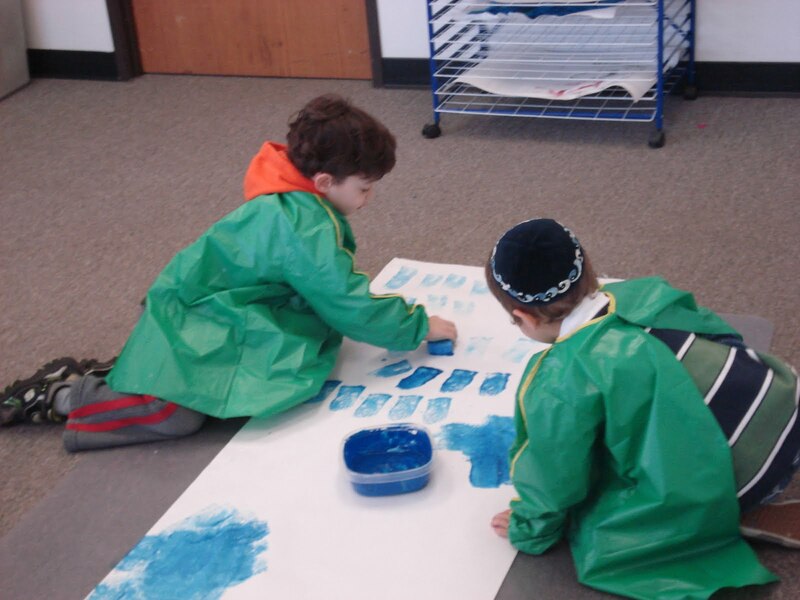 Morah Katie: What can we do if we see a friend or someone sad or crying? 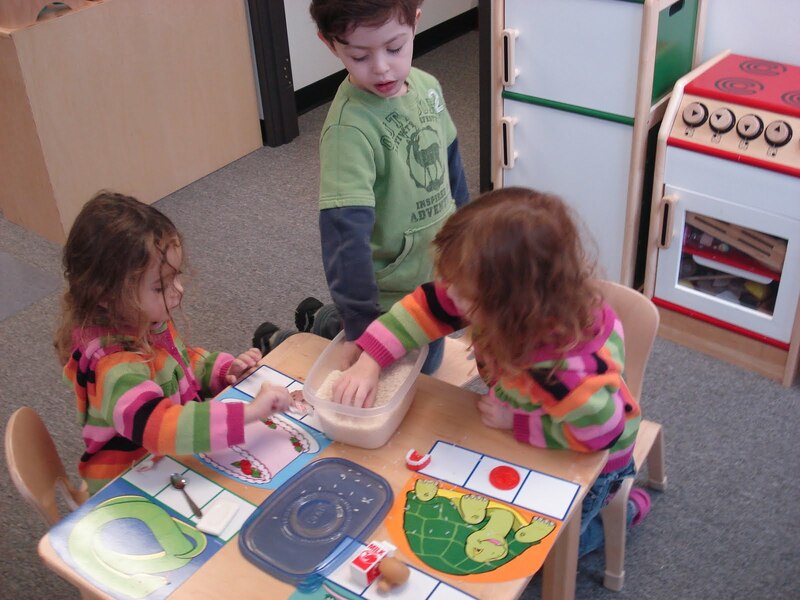 Tori: We can ask them to play or we can ask them to have a little snack with us. Dena: That would be a good thing. We reviewed counting and name writing. As an extension of rhyming we payed close attention to rhymes we heard in our stories. At snack one day we had a spontaneous lesson in subtraction. Each child had 8 pretzels. Morah Katie: Levi you had 8 pretzels, you ate one, how many pretzels do you have? Morah Katie: Daniel, you had 8 pretzels, you ate 2, how many pretzels do you have? We continued taking away/eating/subtracting the pretzels until we were at zero. 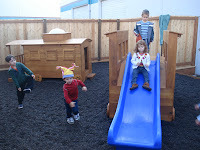 The children are actively involved in creating the environment. 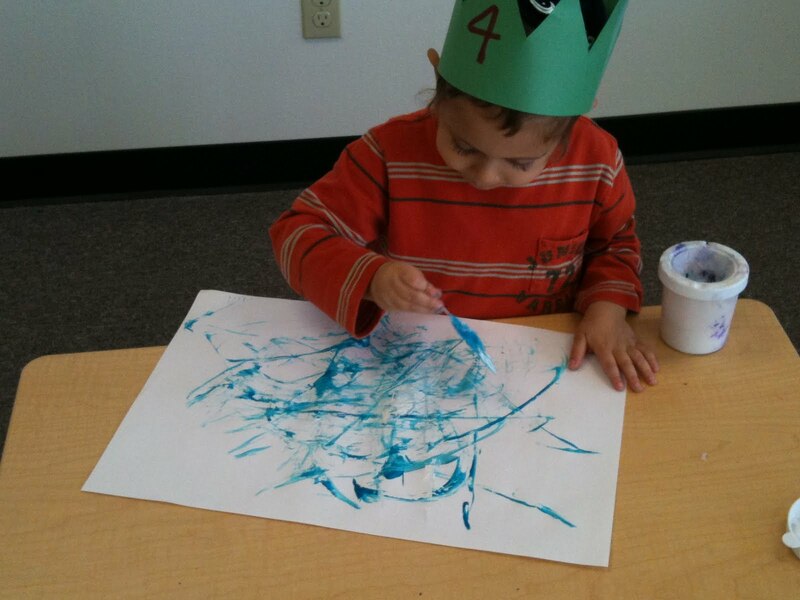 The classroom is slowly filling up with the children's art work and creations. 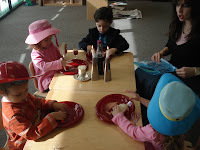 In addition to creating the letter of the week poster, the children also help set the tables for snack and lunch as well as replacing the tables for class time. 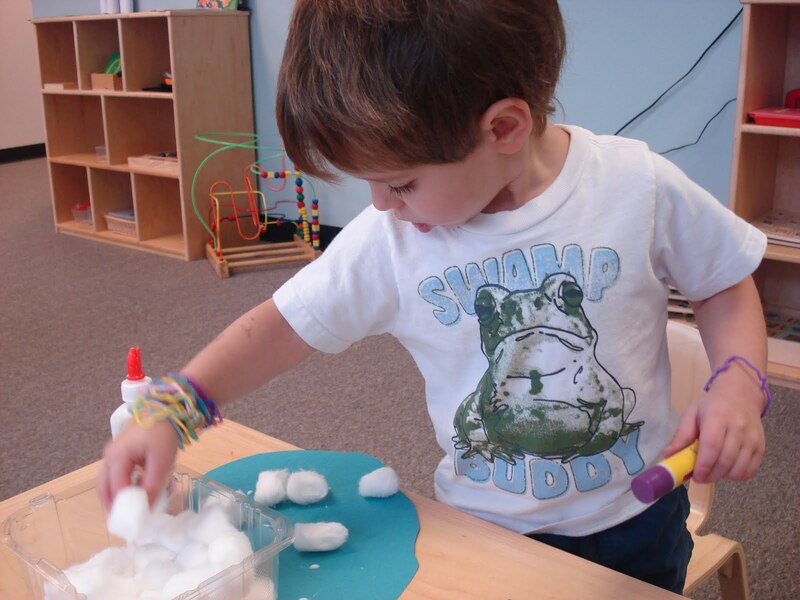 One of my goals is to create an environment where the children can test their capabilities, refine their skills and become independent members who also contribute to the group. 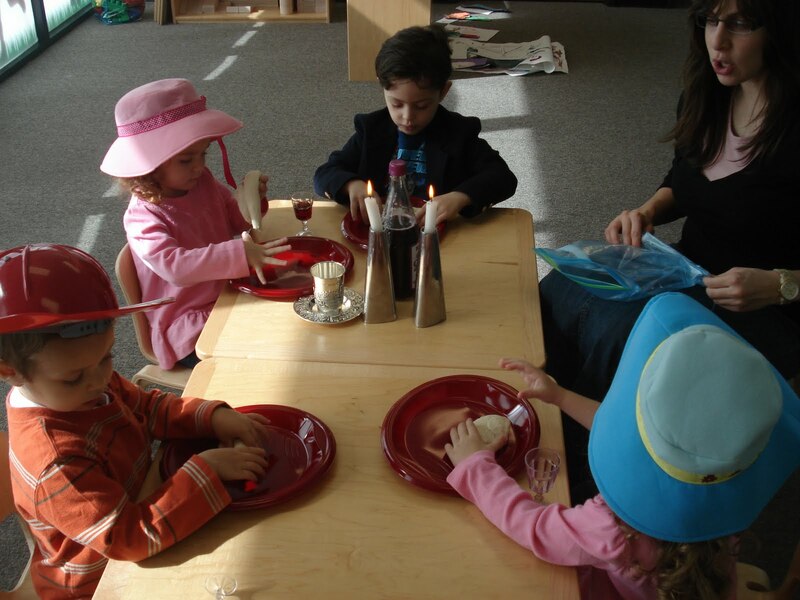 Watching two children carry a table, while two other children bring chairs to the table is a great sight to see. 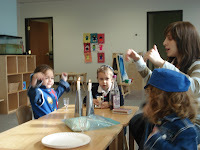 On friday we had a mock Shabbat. We will be making a torah inspired craft next week, please bring two paper towel rolls (or more if you are able) on monday or tuesday.